Dubai: The Dubai Frame project — shaped like a giant window frame — is 35 per cent complete and is expected to be ready in the second half of 2015, Dubai Municipality said on Tuesday. The oversized rectangle will serve as a 150 metre by 93 metre frame of a view of modern Dubai on one side and the older city on the other. There will also be a viewing gallery on the top offering panoramic views. An elevator made of glass will offer unblocked views as visitors travel up and down the sides of the frame. The Dh160 million tourist attraction is taking shape near the Star Gate play area in Zabeel Park, chosen as the location after extensive surveys of what site would offer the best views of new Dubai and old Dubai through the frame. The municipality said the frame is “unique” both in terms of its objectives and design. 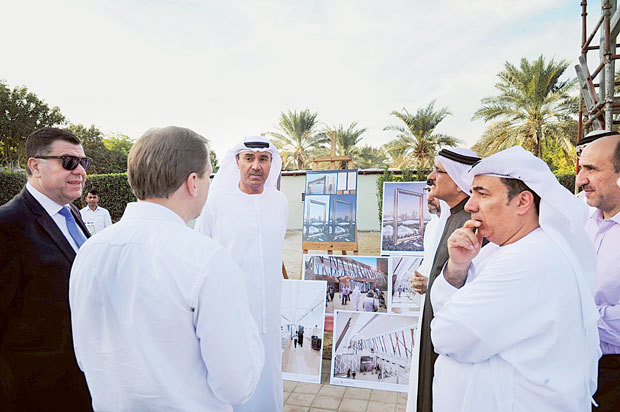 Hussain Lootah, the municipality’s director-general, inspected the progress made on the project on Monday. Dubai Frame has reached a height of 115 metres so far. Officials hope it will draw 2,000,000 visitors a year, joining a long list of iconic Dubai landmarks recognised internationally, such as the Burj Khalifa, the world’s tallest tower; and the Burj Al Arab, a “seven-star” hotel built like a ship’s sail. Those two attractions, as well as other skyscrapers, major maritime projects and coastal features, will be captured in the frame of view when the Dubai Frame is complete. From the other side, visitors will be able to see Old Dubai areas such as Karama, Umm Huhrair, Bur Dubai and Deira. At ground level, there will be multimedia presentations telling the story of Dubai’s rapid transformation from a small fishing and trading town by the sea to a modern metropolis with all its trappings. A museum of sorts for old and new Dubai will showcase relics and objects representing the past and present of the city. There will also be a cafe at the top, offering stunning views while guests have refreshments.